For the first time since late 2008, I went back to using a machine where a hard drive was a part of my primary storage - and I didn’t hate it. Apple’s Fusion Drive is probably the best hybrid SSD/HDD solution I’ve ever used, and it didn’t take rocket science to get here. All it took was combining a good SSD controller (Samsung’s PM830), with a large amount of NAND (128GB) and some very aggressive/intelligent software (Apple’s Core Storage LVM). Fusion Drive may not be fundamentally new, but it’s certainly the right way to do hybrid storage if you’re going to do it. It seems that Fusion Drive is really made for the user who doesn't necessarily have a ton of applications/data, but does have a reasonable sized media collection. For that user, Fusion Drive should be a reasonable approximation of a well managed SSD/HDD setup with your big media files going to the HDD and everything that you launch frequently living on the SSD. I’m always going to ask for a larger cache, but I do believe that 128GB is a good size for most client workloads and usage models today. For me in particular I’d probably need a 256GB cache for Fusion Drive to win me over, but I understand that I’m not necessarily the target market here. The real question is whether or not it’s worth it. I’m personally a much bigger fan of going all solid state and manually segmenting your large media files onto HDD arrays, but perhaps that’s me being set in my ways (or just me being right, not sure which one). Fusion Drive doesn’t do anything to mitigate the likelihood that a hard drive will likely fail sooner than a good SSD, whereas if you go with an internal SSD and external (Thunderbolt or USB 3.0) HDD RAID array you can control your destiny a bit better. Unfortunately, in situations where Fusion Drive is a choice, you don’t often have that flexibility. On the iMac, Apple limits your options quite a bit. You can either buy a hard drive or the Fusion Drive on the 21.5-inch model, there’s no standalone SSD option. There the choice is a no-brainer. If you’re not going to buy your own SSD and replace the internal HDD with it (or try to see if OWC’s rMBP SSD fits), then the Fusion Drive is absolutely right choice. You’re paying handsomely for the right ($250 for 128GB of NAND is very 2011), but if you’re not willing to crack open the iMac case this is really the only way to go. 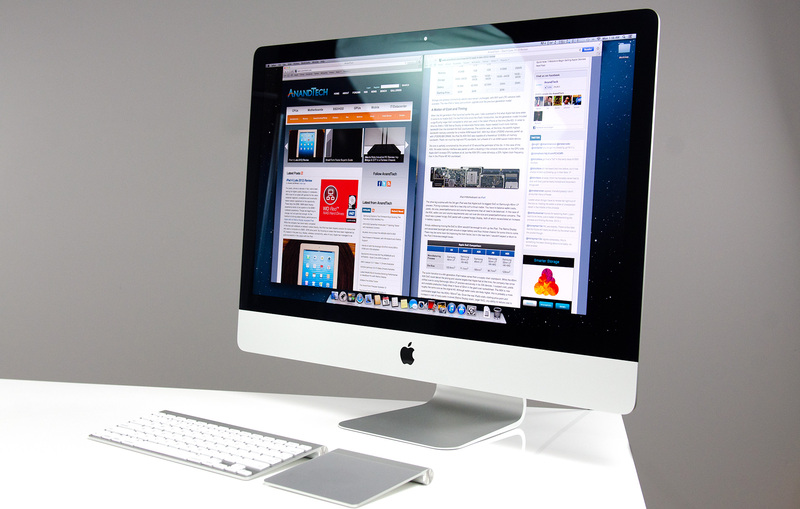 For the 27-inch iMac the decision is similarly difficult. Apple does offer a standalone SSD option, but it’s for a 768GB model that will set you back $1300. All of the sudden that $250 Fusion Drive upgrade sounds a lot more reasonable. On the Mac mini side the decision is far simpler. The Fusion Drive is only available on the $799 configuration (for $250) but so is a 256GB SSD upgrade for $300. As long as you’re ok with using an external hard drive for mass storage, here I’d go for the big standalone SSD. The usual caveat applies: this is only true if you’re not interested in cracking open the mini yourself and using a 3rd party SSD. Hmm... is it just me who finds it slightly disturbing that we are comparing memory management (and, in some posts later, C vs. assembly coding) with the decision on how to organize documents/files? I would say that the intellectual investment is not really to compare. I'm 40+ years old; I still know x86 assembly language and use Ethernet and IP protocol analyzers frequently. I'm fluent in god-knows how many programming languages and build my own desktops. I know perfectly well how to manage storage. But why would I *want* to? I have a demanding day job in the technology field. I have a couple of hobbies outside of computers and am just generally very, very busy. If I can pay Apple (or anyone) a few hundred bucks to get 90% of the benefit I'd see from spending several hours a year doing this... why in the world would I want to do it myself? I wonder how you organize stuff right now? Even before I had more than one HDD I still had multiple partitions (one for system and one for media at the time), so that I could reinstall windows without having my media touched. And that media partition was segregated into photos, music, movies, documents etc. That is how I organize my files and know where what is located. I don't see any change to my behaviour with an SSD functioning as my system partition and the HDDs functioning as media partitions. Do you not have any type of file that's both large, numerous, and demands high performance? I regularly work with Virtual Machines, with each of them usually being around 10 Gb (some being as small as 2, with the largest closer to 60). I have far too many to fit on my machine's SSD, but they're also /far/ faster when run from it. So what do I have to do? I have to break my nice, clean hierarchy. I have a folder both on my SSD and on my eSATA RAID for them. The ones I'm actively working with the most I keep on the SSD, and the ones I'm not actively using on the HDD. Which means I also have to regularly move the VMs between the disks. This is /far/ from an ideal situation. It means I never know /exactly/ where any given VM is at any given moment. On the other hand, it sounds like a Fusion Drive set up could handle the situation far better. If I hadn't worked with a VM in a while, there would be an initial slowdown, but eventually the most used parts would be promoted to the SSD (how fast depend on implementation details), resulting in very fast access. Also, since it isn't on a per-file level, the parts of the VM's drive that are rarely/never accessed won't be wasting space on the SSD... potentially allowing me to store more VMs on the SSD at any given moment, resulting in better performance. So I have potentially better performance over all (either way, I doubt it's too far from a manual set up), zero maintenance overhead of shuffling files around, and not having to destroy my clean hierarchy (symlinks would mean more work for me and potentially more confusion). VMs aren't the only thing I've done this way. Some apps I virtually never use I've moved over (breaking that hierarchy). I might have to start doing this with more things in the future. Since I don't use my computer for any work, I don't have large files I need frequent access to. How many of those VMs do you have? How big is your current SSD? Adding the ability for FD adds 250 to 400USD which is enough for another 250 to 500GB SSD, would that be enough for all your data? If you are doing serious work on the PC, I don't understand why you can't justify buying a bigger SSD. It's a business expense, so it's not as expensive as it is for consumers and the time you save will mean a better productivity. I don't know which physical location my files have, so I cannot easily upgrade one of the drives. I also don't know what happens if one of the drives fail, do I need to replace both and lose all the data? It introduces more complexity to the system which is never good. Performance may be up for some situations, but it will obviously never rival real SSD speeds. And as Anand showed in this little test, some precious SSD space was wasted on video files. There will be inefficiencies. Though they might get better over time. But then again, so will SSD pricing. Currently, 10 VMs, totally approximately 130 GBs. My SSD is only 128 GB. Even if I'd sprung for a 500 GB model (which would have cost closer to $1,000 at the time), I'd have still needed a second HDD to store all my data, most of which would work fine on a traditional rust bucket, as they're not bound by the disk's transfer speed (they're bound by humans... i.e. the playback speed of music/video files). Also, for any data stored on the SSD by the fusion drive, it wouldn't just "rival" SSD speeds, it would /be/ SSD speeds. I'm also not sure what your comment about RAM is about... Operating Systems do a very good job managing RAM, trying to keep as much of it occupied with something as possible (which includes caching files). There are extreme cases where it's less than ideal, but if you think it'd be a net-win for memory to be manually managed by the user, you're nuts.